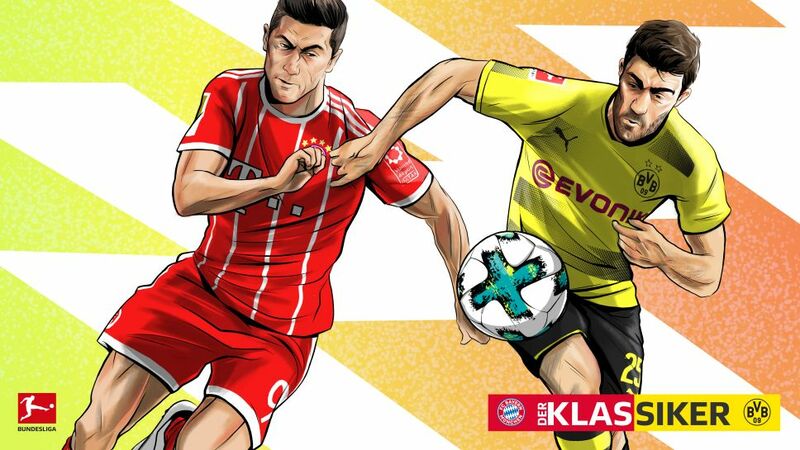 A footballing spectacle that almost never disappoints, don't doubt that Der Klassiker between Bayern Munich and Borussia Dortmund will once again delight when the action gets underway on Saturday. But where will the weekend showpiece be won and lost? bundesliga.com assesses some of the key battles to look out for. Few on-field battles in the world game can match this one: Captain America versus the Colombian skills king. James is having a season to swoon over, and many followers of Bavarian giants Bayern are left feeling giddy when watching their new hero. A colossus of close control and boasting x-ray-like vision, the 26-year-old James has produced seven precious assists in 17 Bundesliga games so far this term while also showing he can provide the goods in front of goal when it matters too. Watch: How James Rodriguez runs the Bayern show! The South American's four goals have drawn plenty of praise, not least from coach Jupp Heynckes. “In his current form and in how he has integrated himself, James is a God-send for Bayern Munich,” the top tactician told reporters earlier this season. The handsome trickster took his reputation to even greater heights when he conjured up a five-star display in this season's previous Bundesliga Der Klassiker, and he will be determined to outdo Dortmund one more time on Saturday. But cool-hand Christian Pulisic will look to reach into his plentiful pack of power cards in order to prevent the hosts potentially picking up their sixth-straight Bundesliga title. The wing wizard may not be singing from the same hymn sheet in terms of stats as the on-song James in 2017/18, yet the Hershey hero is nonetheless capable of a virtuoso display that can turn a match. His 13 assists across all competitions last season set the foundations of a player who will no doubt become a legend before he hangs up his overworked boots in the far-off future. Don't believe us? Then let the words of another BVB teen, Jadon Sancho, do the talking. "When he plays, everything seems so simple and normal. I want to be like that too. He's only two years older than me, but what he has already achieved with the USA, despite the huge pressure on him, is an inspiration for me," the FIFA Under-17 world champion said. Watch: How might Bayern get at their Klassiker opponents on Saturday? The planet is well schooled on the phenomenon that is the prolific Polish goalgetter. Yet few can know him better than Sokratis, who has garnered plenty of knowledge from his 17 Klassiker appearances through the years. Die Schwargelben's central defensive star spent one season studiously examining Lewy in countless training sessions when the Bayern behemoth was at BVB, and the tough-tackling Greece international will need to reexamine his notes on the forward in the lead-up to this glorious game. And should he successfully pass Saturday's exam, don't be surprised if the serene Sokratis earns a gold star by scoring what would be a tenth career Bundesliga goal. Stranger things have happened. Not that Lewandowski fears any defender, of course. The Warsaw warrior recently racked up his 100th Bundesliga goal for Bayern and he will be craving a higher spot on the all-time chart of Klassiker marksmen, his eight goals in this fixture placing him joint-third on that particular list. Watch: Hungry for some Lewandowski goal action? Feast on this! As many as seven of those strikes came while playing for the men in red against his former team and while he is on course to take a third Bundesliga Torjägerkanone thanks to his 23 top-flight goals so far in this campaign, his presence could prove the deciding factor in the latest version of Der Klassiker as he looks to add to his terrific tally. Line this pair up in a Street Fighter-style scenario and there would arguably be only one winner: Javi Martinez's brawn likely to loom large over Julian Weigl's slight build in a console clash. Yet in the real world, there is little to choose between them in terms of importance to the Klassiker cause. The 22-year-old Weigl is a visual delight to the footballing connoisseur, a slim package of core strength providing perfect physical balance for his brilliant brain to work. Few players in the Bundesliga operate between defence and attack with the effectiveness of this Bavarian-born boy who once likened himself to a piece in the BVB jigsaw. When he looks up to pick out a pass on Saturday, Weigl will no doubt clock the focused stare of Martinez a little further ahead. The Spain international sings to a similar hymn sheet, but trumps his Dortmund counterpart for energy and muscle. Following a fabulous career, Mr. Reliable Mats Hummels is recognised as a role model the world over in how to defend with diligence while under attacking duress. A man who knows Bayern's opponents from the inside, the 29-year-old perfected his craft in 225 Bundesliga games at Dortmund between 2008 and 2016, and if anyone can stop the in-form figure of Michy Batshuayi - and Bayern must - then it is surely he. Basing his game on a style that is often compared with that of Franz Beckenbauer, the Bergisch Gladbach-born defensive giant will slide in to win possession before making tracks upfield or setting up a forward thrust with a precise cross-field pass or threaded through ball. Watch: 60 seconds under pressure with Mats Hummels! It will be a stern test of all of Hummels' physical and mental strength to keep Batshuayi at bay, with the Belgian one of the continent's most in-form forwards right now. Loving life at BVB following a loan move from Chelsea, the goalscoring powerhouse has fired home eight times in eleven games in all competitions, including a goal of the season contender against Hannover. Watch: Batshuayi and THAT goal of the season contender! "I really never expected to settle so quickly," the former Standard Liege and Marseille man said before a recent international with Belgium. "This is the real Michy, but I still want more," he added. Mats Hummels and Bayern beware! Click here for more Klassiker content!